T-Mobile released its third quarter earnings report this morning in which it recorded total revenue of $4.9 billion, down 6.4 percent since the same quarter last year. Its service revenues totaled $4.3 billion, also down 8.7 percent from the third quarter of 2011. The carrier continued to shed customers, too – it lost 492,000 subscribers during the quarter. The good news? That's a slight improvement over the 557,000 customers it lost during the second quarter of this year. It blamed the increased year-on-year losses on the launch of the iPhone 5. "Our strategy, including our ability to deliver more affordable, faster 4G services to more customers in more metropolitan areas, will be significantly accelerated by our proposed combination with MetroPCS," said John Legere, President and CEO of T-Mobile USA. "With MetroPCS, we aim to become the industry's leading value carrier – for both prepaid and contract service offerings – with the scale, spectrum and financial resources to aggressively compete with the other national carriers." T-Mobile also said its $4 billion network modernization plan is moving along as planned. "The combination of T-Mobile USA and MetroPCS will further deepen the Company's LTE spectrum position in key metropolitan areas and provide a path to an at least 20 by 20 MHz LTE deployment in 90% of the top 25 U.S. markets," said René Obermann, CEO of Deutsche Telekom. T-Mobile USA, Inc. ("T-Mobile") today reported its third quarter 2012 results, which demonstrate that successful execution of the Company's Challenger Strategy continues to improve performance in key operational and financial areas. 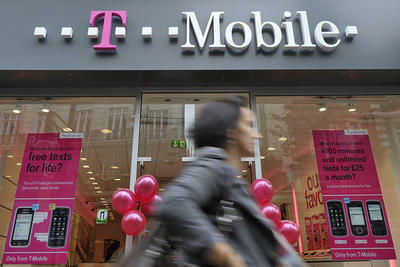 T-Mobile ended the third quarter of 2012 with 33.3 million customers, a net addition of 160,000 customers compared to the second quarter of 2012. The sequential improvement was driven primarily by the continued expansion of branded prepaid customers and a reduction in branded contract net customer losses. The Company's branded prepaid customer growth was its best quarterly performance of this year and exceeded the annual growth reported in 2011. In the quarter, the Company reported adjusted OIBDA of $1.2 billion and an adjusted OIBDA margin of 29%. As expected, third quarter 2012 adjusted OIBDA reflects higher advertising expenditures related to the Company's brand re-launch. "We continue to make solid progress with our Challenger Strategy, as evidenced by our strong performance in prepaid services, the growing attractiveness of our Value and Unlimited plans, the execution of our network modernization program, and the expansion of our popular handset portfolio," said John Legere, President and CEO of T-Mobile USA. "Our strategy, including our ability to deliver more affordable, faster 4G services to more customers in more metropolitan areas, will be significantly accelerated by our proposed combination with MetroPCS. With MetroPCS, we aim to become the industry's leading value carrier – for both prepaid and contract service offerings – with the scale, spectrum and financial resources to aggressively compete with the other national carriers." "The combination of T-Mobile USA and MetroPCS will further deepen the Company's LTE spectrum position in key metropolitan areas and provide a path to an at least 20 by 20 MHz LTE deployment in 90% of the top 25 U.S. markets," said René Obermann, CEO of Deutsche Telekom. T-Mobile continues to make significant progress in executing its Challenger Strategy. In September, John Legere was named President and Chief Executive Officer of T-Mobile and has reiterated his strong commitment to the Company's Challenger Strategy. T-Mobile continues to advance its $4 billion 4G network modernization plan, which includes installing new advanced equipment that paves the way for the launch of Long Term Evolution ("LTE") service in 2013. Las Vegas and Kansas City were the first cities where T-Mobile customers benefited from the launch of HSPA+ on 1900 PCS spectrum, which delivers enhanced voice and data coverage, as well as faster speeds on unlocked devices such as the iPhone; just yesterday, Washington DC, Baltimore, and Houston also went live. The Company expects to announce further network strengthening in many additional cities in the coming months. In the third quarter of 2012, T-Mobile completed the transaction announced in June 2012 with Verizon Wireless for the purchase and exchange of AWS spectrum licenses in 218 markets across the U.S. This transaction improved T-Mobile's spectrum position in 15 of the top 25 markets nationwide. T-Mobile continued to expand its compelling 4G smartphone portfolio, including adding more devices under the popular Samsung Galaxy lineup, such as the Samsung Galaxy Note 2, and announcing the upcoming availability of two Windows Phone 8 smartphones, including the exclusive Nokia Lumia 810. T-Mobile is a champion of "bring your own device (BYOD)" wireless, with affordable value plans that separate the cost of wireless service from the purchase of a new phone. In early September, T-Mobile launched a new Unlimited Nationwide 4G Data plan that is a key differentiator in the marketplace. As part of its brand re-launch program, the Company increased investment in advertising to highlight its fast and reliable nationwide 4G network and its blazing fast data speeds in the U.S. In the Business-to-Business (B2B) segment, T-Mobile looks to serve as a trusted communications advisor, helping businesses develop cost-effective, high-value communications programs that meet their business objectives –through bring-your-own-device (BYOD), and mobile device management (MDM) programs as well as attractive international mobility and mobile broadband data plans. The Company continues to aggressively expand its B2B sales force. T-Mobile launched three new Mobile Virtual Network (MVNO) partnerships during the quarter: Spot Mobile, Solavei, and UltraMobile, adding to its existing partnerships with TracFone/SIMPLE Mobile and Roam Mobility. The Company continues with its efforts to drive operational efficiencies through the Reinvent program and is on track to achieve $900 million in annual gross cost savings, which the Company has started reinvesting in customer acquisition programs. On October 3, 2012, Deutsche Telekom and MetroPCS announced their intent to combine T-Mobile and MetroPCS and create the premier "Challenger" in the U.S. wireless market and the value leader for contract and no-contract service offerings. The complementary spectrum holdings of the two companies will enable a deeper LTE network deployment, with a clear path toward at least 20 by 20 MHz of 4G LTE in many areas of the country. The combination will yield projected cost synergies of $6 to $7 billion. A combined T-Mobile and MetroPCS will represent an attractive growth company with healthy projected growth rates, including a projected 7% to 10% EBITDA CAGR over the next five years. For more detailed summary of third quarter 2012 financial results, please see the separate financial results release issued by T-Mobile today.